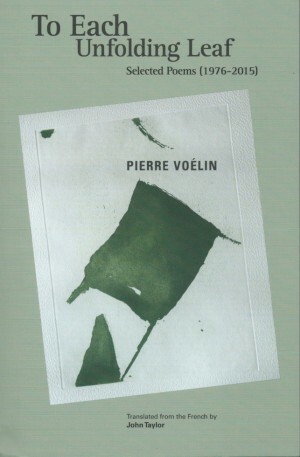 Très bel article du critique Greg Bem dans le numéro de janvier 2018 de la revue « Rain Taxi » sur le livre de Pierre Voélin, « To Each Unfolding Leaf: Selected Poems 1976-2015″ (Bitter Oleander Press, 2017): This first major collection of English translations of Pierre Voélin’s poetry is monumental. Translator John Taylor shows himself capable of taking these works in their original French and, through impressive translation, reinvigorating their mental and lyrical capabilities. . . » (la suite de l’article ici).